Lavishness and visions of grandeur need not be out of reach with a well decorated mantel. While an overmantel mirror provides an unmistakeable appearence, a mantel clock adds compelling character, no matter how subtle or striking. 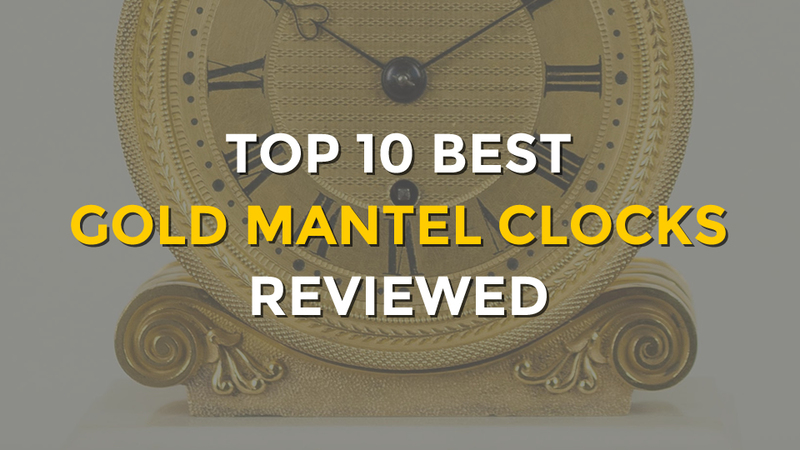 To keep in line with classic elegance, here are our top 10 best gold mantel clocks. Presenting a vintage design with modern detail, this stylish gold mantel clock from the London Clock Company features decorative hands, a separate second hand display and Roman numerals on the clock dial. The Round Carriage Clock displays an exposed mechanism which shows off the inner workings, and a faux keyhole. 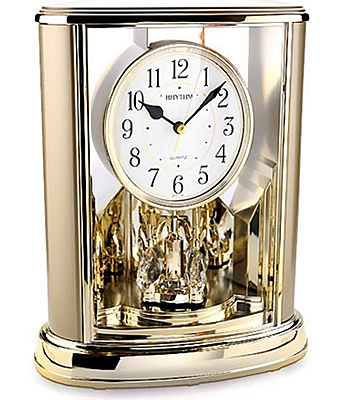 The clock, which sits beautifully on a gold effect metal stand has a lovely ticking sound to evoke memories of a bygone era. 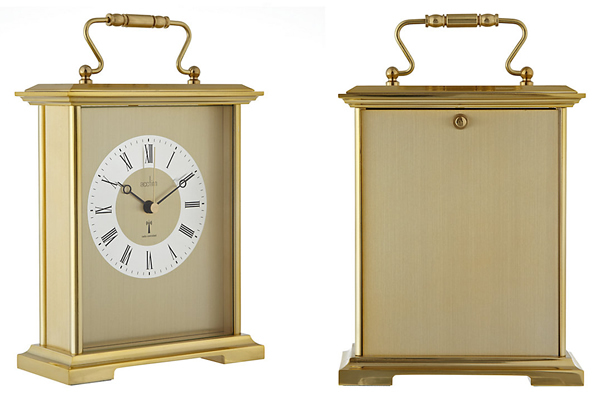 With a large oval display and large clear numerals on the clock dial, the RHYTHM Gold Mantel Clock was made to stand out. This ornate mantel clock also features a moving crystal effect pendulum that’s imposing to say the least. 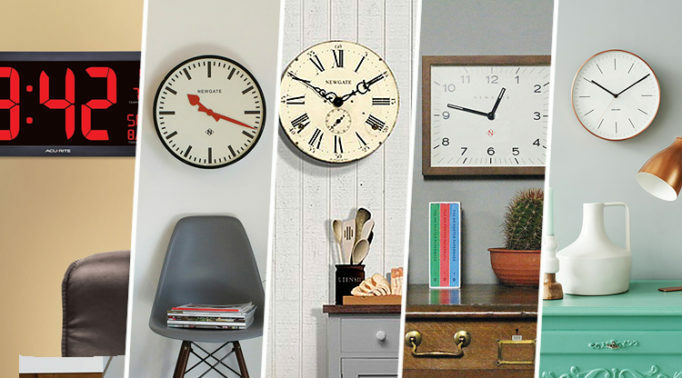 While similar clocks produce a loud tick, this mantel clock is much quieter and so perfect for someone who doesn’t want their timepiece to dominate a front room or dining room. Encased in an attractive gold coloured aluminium body, the Acctim Gainsborough shows luxury through subtle details such as its distinctive handle, bold black dial with Roman numerals, and golden seconds hand. This neat and tidy timepiece fits into the category of smaller sized mantel clocks, measuring 14.5 x 12.3 x 5.5cm, and has a lovely quiet tick to match its low-key aesthetics. 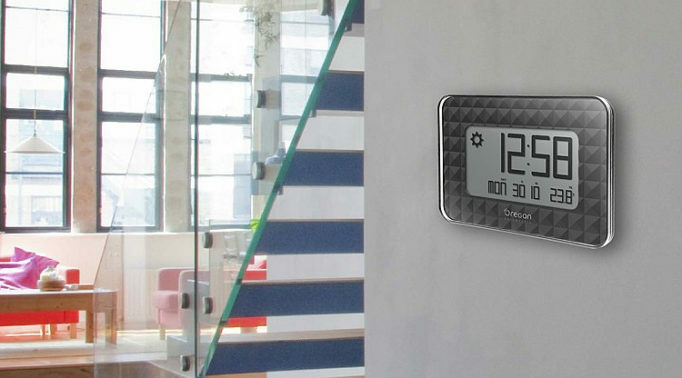 It has the added feature of containing a Bi-Bi alarm, which is set with the aid of an alarm hand – a nice modern twist on an otherwise classic-looking clock. The Acctim Berwick strikes up a large and bold design that features a gold effect metal case, glass inset, decorative black hands which point to Roman numerals on a floating style metal dial with a spun chapter ring. This prominent gold mantel clock measures 18.8 x 15.2 x 45cm and will surely catch the eye of guests that enter the living room. 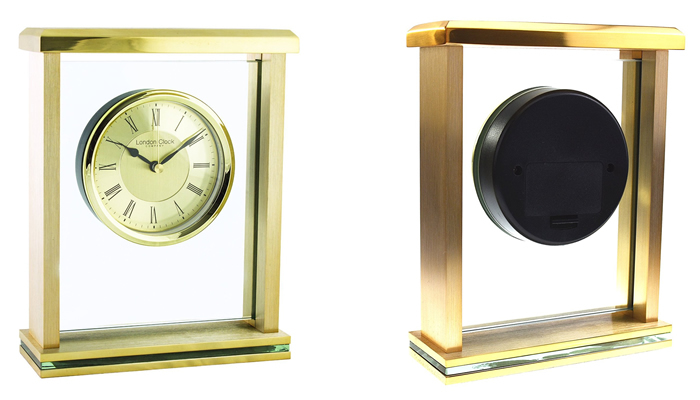 Classically inspired with touches as class, the Radio Controlled Carriage Clock by Acctim is a strong contender for best gold mantel clock in a vintage style. 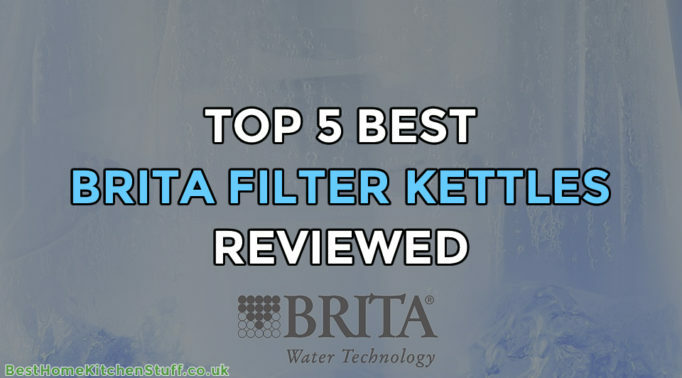 Its elaborate handle gives it a distinctive look, sat on top of its elegant polished aluminium case. Behind the clear glass lens and simply-designed dial with Roman numerals is the really clever bit. It’s not battery operated, but radio-controlled, making it the perfect hybrid of heritage charm and 21st Century technology. Being radio-controlled means it will always keep good time and will update itself automatically when the clocks change each March and October. 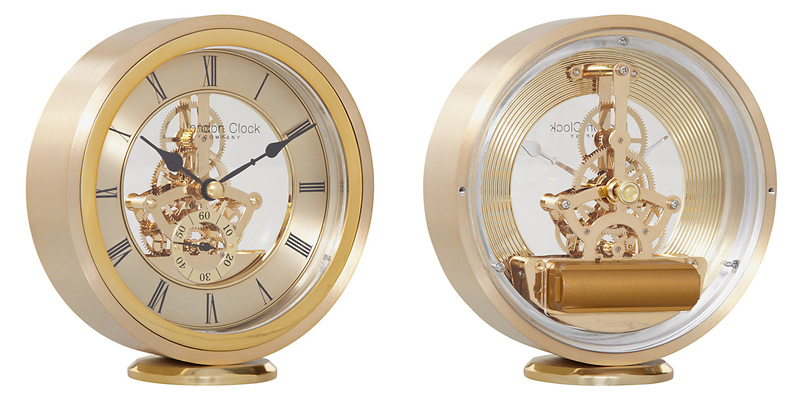 With a dial face set back from the front, the conspicuous Flat Top Gold Mantel Clock by London Clock might give you the impression that you’re looking into a ship’s porthole. The brushed metal golden dial is held within a glass inset and features tall black Roman numerals that complements the dial. At its base is a layer of glass, sandwiched between the gold frame, which gives the clock a unique attraction. Available in silver too, this mantel clock adds a sense of grandeur to any living room. 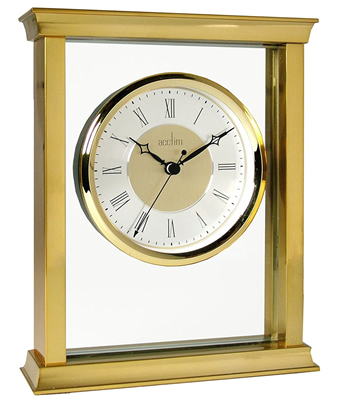 Elegantly slim and visibly wide, the Acctim Colgrove gold mantel clock presents a vintage design that has a polished gold effect metal case and an attractive floating effect dial with a gold effect bezel. 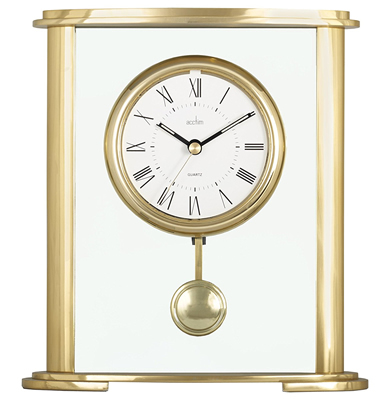 The pin-sharp Roman numerals on the dial set against a white background makes it easy to read from a distance, while looking splendid whether on top of the mantel in the living room or on a desk in the bedroom. 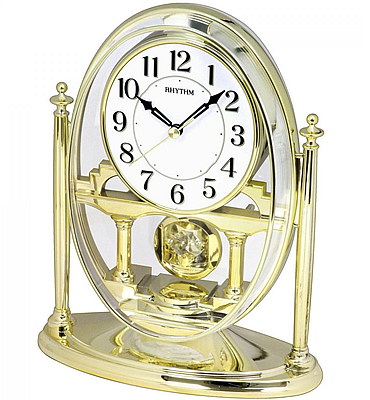 One of the best gold mantel clocks to make a big statement is the Seiko Rotating Pendulum Mantel Clock, a perfectly fitting gift for weddings and anniversaries. The dial is uncomplicated with italic style numbers between gold trim and black hands. To keep in line with its simplicity, a seconds hand is not featured. 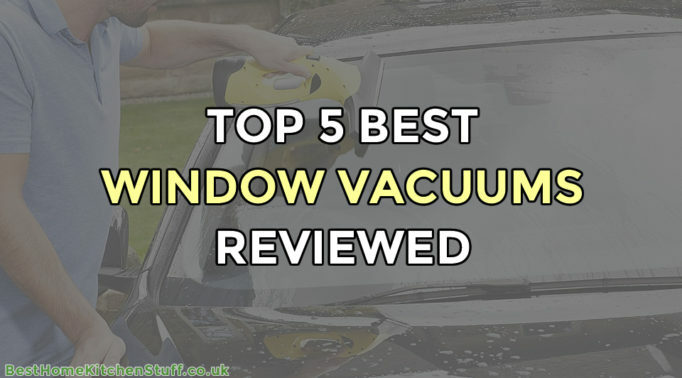 On the contrary, the dominant characteristic is a one-way rotating pendulum, accentuated by hanging glass crystals and reflective surroundings, a real eye-catcher. Standing gracefully tall in a pale gold case, the Black Arabic Numerals Mantel Clock by RHYTHM is a tasteful decorative piece to add in any home. Featuring a floating style white dial for clarity, the black hour and minute hands and gold-effect seconds hand point to easy-to-read black Arabic numerals. 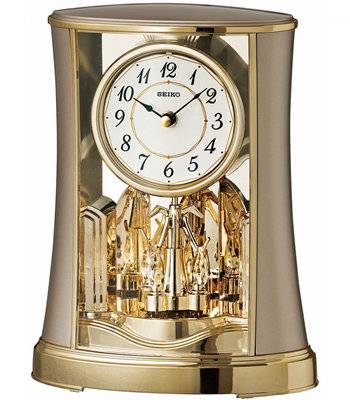 Much like the Seiko mantel clock featured at number 3, hanging crystals rotate around the pendulum reflecting light when shone on it, highlighting the details of the mantel clock even more. 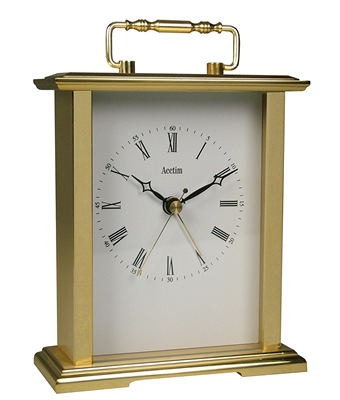 Beautifully elegant and essentially functional are the ideal words to describe the Acctim Welwyn, our best gold mantel clock. The polished gold effect flat top metal case surrounds a glass inset that holds a floating style white dial, emphasised by simple and straight-forward Roman numerals and minute/seconds hands. A prominent gold effect bezel strengthens the look of the dial even more, while the star attraction, a modest swinging pendulum hangs beneath. The quartz pendulum moves through a magnetic pulse sent by the battery and swings back and forth in a beautifully hypnotic rhythm, offering a comforting sound. 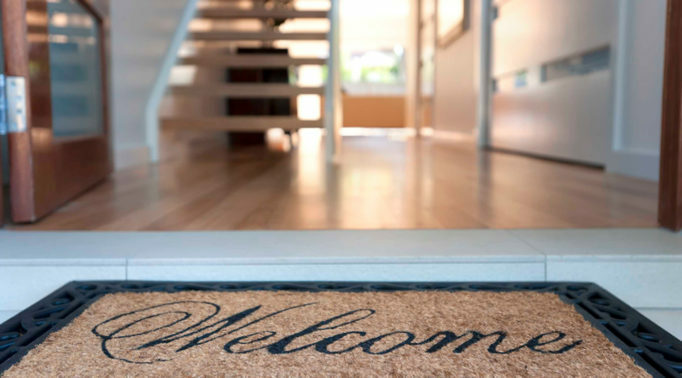 In a home with a lavish aesthetics, the Acctim Welwyn harmonises with its surrounding decor, presenting a timepiece that anyone can fall in love with.